These StoneCrest slate shingles are made of heavier gauge steel and have been double stamped for a more dramatic look. 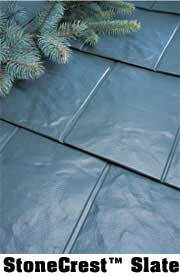 StoneCrest Slate shingles closely replicate the random finish of natural slate. Shingles are available in a wide variety of colors. mph. See Limited Warranty for details.